This is certainly one of the more usual lots we've ever seen in our auctions. This card was made using a copper letter press which the seller had access to via work. 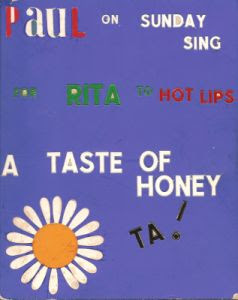 She made it to request that Paul and The Beatles sing A Taste of Honey for her boyfriend. It was certainly eye catching as Paul not only read the request on stage at the Cavern Club but also performed the song for them. 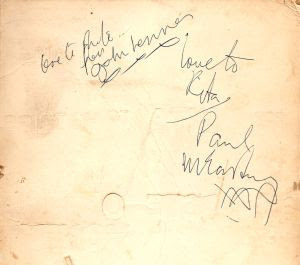 Afterwards Cavern DJ Bob Wooler suggested she try and get the card autographed and she managed to get Paul and John to sign it on the reverse for her. This a unique item and part of the rich tapestry of Beatles History from the Merseyside area, and that's not including the fact that it is signed by two of the Fab Four! The signatures are in pen, and are both dedicated to Rita. Do you have something you'd like to put in the auction? If you have a item you would like to be considered for this year's auction all you have to do is get in touch with us. The best thing to do is to call us with the item in front of you so we can ask you questions about it. Or email us a photograph or scan of the item. We can't assess autographs over the telephone as we need to see them. A scan or clear laser photocopy is usually sufficient if you can't bring them into the shop for us. When you call us you need to ask for Stephen. He is the manager and the person who assesses all the items that go into the auction. Please note, he doesn't work on a Friday, but is usually around every other day of the week including weekends. It's best to ring to see if the item is something that can be placed in the auction before you bring it in to see us. Sometimes we get too many of a particular item and therefore limit the number we put up for sale. All the contact details are available at the end of this post and via the link on the right. When you do bring something in for the auction, we take it in and give you a receipt for it. Very often we photograph the item to include it on your receipt. Once we have the item it is photographed if it is to be included on this blog and for reference and then it is taken away to be stored securely until August. Items have to be brought in to us in advance. We have a limited number of spaces in the auction due to time constraints and often we have enough items well in advance of the sale. Stephen will happily advise you on setting reserves for the more valuable items, and you may be asked to confirm any reserves shortly before the sale. Make sure the contact details we have for you are correct as this is where the cheque will be sent. It's important that if you move house you let us know so we can change your details. Cheques are sent out approximately 35 working days after the sale. This is to allow for all payments from buyers to clear and to cover a time limit that allows for any disputes over items. It's very important that you read the notes for sellers on this site and the terms and conditions that should be printed on the reverse of your receipt for the item as this explains the handling fees involved with the sale and VAT. If you have any questions about this please let us know. Address- The Beatles Shop, 31 Mathew Street, Liverpool L2 6RE.